This was not what anyone was expecting. The Sycamores came into Simon Skjodt Assembly Hall tonight and blew the doors off the Hoosiers, as the Archie Miller era got off to a rough, embarrassing start. Yes: Indiana State hit some tough shots. Heck, the Sycamores hit some impossible shots. But Indiana’s defense — a key area of focus heading into this game for Miller and his program in general — left plenty to be desired. In the first half, Indiana let shooters loose on the perimeter and Indiana State really made them pay, shooting a blistering 10-of-15 for distance. The Hoosiers made it too easy for them to get into the paint as well. When the dust settled on the first half, the Sycamores entered the locker room with 1.47 points per possession. Indiana State stayed hot from distance in the second half. By game’s end, the Sycamores set an opponent record for made 3s inside Assembly Hall with 17, shooting 65.4 percent from beyond the arc. There were more stats that raised some eyebrows. A season ago, Indiana had the Big Ten’s worst defense. But they never allowed 54 points in a half all season, which the Sycamores tallied at halftime en route to a 21-point lead. While Indiana State made 17 3-pointers, Indiana only had 21 field goals to match. This was Indiana’s first home opener loss since 1984. And after posting turnover percentages in each exhibition better than any mark a season ago, tonight was downright terrible in that department. The Hoosiers turned it over on 26.5 percent of their possessions, which the Sycamores turned into more than a third of their points (34). Let an opponent hit 17 3-pointers against you and turn it over on more than a quarter of your possessions ? Not a recipe for success. Early on, the pace and intensity of this game seemed a little faster, a little quicker, and Indiana failed to match Indiana State’s energy. The Hoosiers felt a little frantic and discombobulated on both sides of the ball. And once they got down big by halftime, there were really no signs of life in the second half. 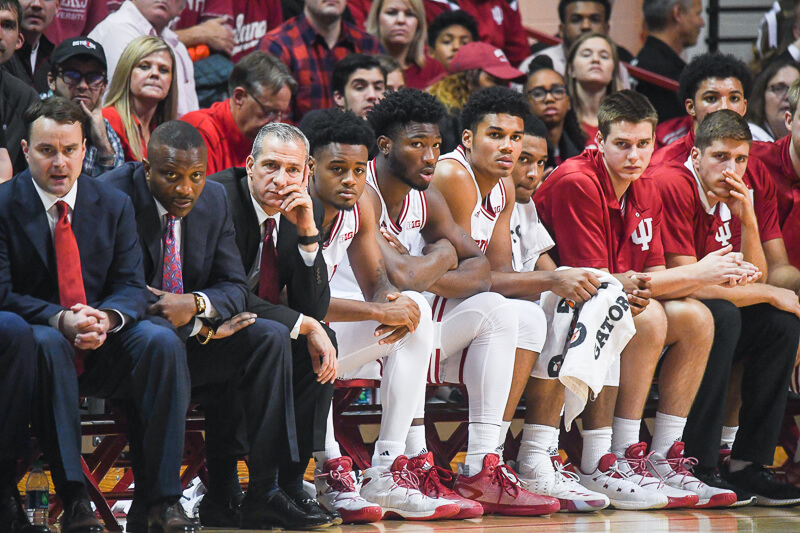 Indiana’s body language wasn’t great, the crowd didn’t have much to get into and it all amounted to a final 20 minutes in which Indiana never threatened to seriously get back into this one. Juwan Morgan (5-of-10), De’Ron Davis (6-0f-7) and Curtis Jones (3-of-6) were the only Hoosiers to make three or more buckets. Indiana’s senior guard Robert Johnson and Josh Newkirk went a combined 4-of-15. Devonte Green shot the ball just twice in 25 minutes of action. He missed both. It’s way too early to tell if this is a sign of things to come. But Indiana plays a ranked Seton Hall team on Wednesday. Duke looms two weeks after that. The weirdness of this year’s Big Ten season brings Michigan and Iowa to the docket in early December. Cupcakes, these squads are not. For a team that looks like it’s going to struggle to find consistent scoring night in and night out, they must take care of the ball like they did in the exhibitions and figure out Miller’s principles on defense. Or else it’s going to be a long year. Archie just found out his team is ‘soft’ (that’s the word he used). Probably didn’t know till now. The team probably just found out. Heck we all just found out. So he just added that to his coaching agenda. There’s an art to making a team tough without them bailing on you, so this should be interesting. I guess this was not too surprising all things considered. This is practically the same team that made the NIT last year and lost by double digits, and somewhat embarrassingly, to Georgia Tech. Take away the three best players on that team and insert a new coach with a completely different philosophy on playing style, then exactly what do we have? Well, we found out last night. This may be a long season. Still hopeful, but last night was not a step in the right direction for this group. On a side note, maybe it’s time for Johnson to ride the pine and let the freshman get some work. His poor play is carrying over from last year, and it’s not good for this team. Maybe some thinking time on the bench would be good for him. Totally. In the presser, he kinda mentioned that. He was optimistic, but added the caveat that they also have to “remain coach-able” or something like that. If they stick with it, get tougher and don’t bail on the program, they’ll get better (tougher). Let’s see if he can pull it off. Fair comments. Coach mentioned that “thinking instead of playing” thing in press conference post game. But even so, they seemed to still lack fight (and offense), which was the most frustrating part. If I was going to counter this and HooHeel’s thought (which I’m not, really), it would be to say this: what i saw was uncertainty and tentativeness more than a lack of fight. They were flat from the start (as were the fans; it was just a lousy game all around), but I saw real hesitation in them at both ends of the court. I am certain the tape will show repeated breakdowns in defensive positioning, particularly on switches and rotations. They just don’t have the mechanics and communication of the new defense down yet. Same thing on offense. Think about Devonte Green, almost certainly our most aggressive offensive player. He wasn’t even LOOKING for his shot last night. Nor was he looking to drive. He was almost entirely a passive presence on the perimeter, just shuttling the ball along to the next guy when it came to him. He took only two shots all night, which is not about “fight”, it’s about clarity. Archie himself said it after the game: the whole team is uncertain right now, trying to learn not just a new system, but new roles within the system, and DG is trying to find the balance Archie wants between scoring and helping others score (and he did lead the team in assists, for whatever that is worth). When things are going poorly and you don’t have the confidence and clarity to play with abandon, I think it’s harder to fight. Good basketball is played with freedom and flow, and we have none of either right now. It was apparent that some guys were more into it than others — AD brought notable energy, and I would like to have seen more of him on that basis alone, and DG did have 2 steals in the second half, so he stayed after it even after the outcome was clear — but as long as we don’t know what we are doing, we will look hesitant and flat. I’m sure Archie will put some fire in them, but that will only go so far. They will look more aggressive and energetic as their familiarity with the new program deepens, because they will in fact be more aggressive and energetic in its application. Injured groin, will miss a couple of weeks. It was apparent to me that these guys are still struggling to adopt Archie’s system. I think Archie is asking them to do things, scheme-wise, that are almost the complete opposite of Crean. For the upperclassmen (RJ and Juwan, in particular), it will be hard to break the habit–almost muscle memory–of the old system and adopt the new. I saw one first half possession where Juwan mistakenly switched on a ball-screen, resulting in an uncontested 3-pointer (by Devonte’s man, and Devonte was not happy about it). Archie has said he will very seldom switch ball screens (unlike Crean, who almost always did) but there were many other instances where guys really seemed to struggle fighting through a screen without switching. Then, in the second half, Juwan came out switching all ball screens, almost as if Archie was throwing in the towel for this game and just letting the guys do what they were comfortable with to see if that would staunch the onslaught (it didn’t). No such thing as “saving” a player. The best players play, period. If he isn’t playing, especially in an embarrassment like last night, it’s because he isn’t showing game readiness in practice. I frankly think that there has been WAY too much hype over him. He may someday be great, but he was an unranked player whose other offers were almost entirely from mid- and low- majors. I don’t mean that disrespectfully, and I’m certainly not unhappy he is a Hoosier. But it is no surprise that he is not ready. I hadn’t watched or seen his post game remarks, so its gratifying to hear he said that. My guess is it will be well into January until we know what we really have for a team this year. If they end up buying in 100% on Coach Miller, we will be one of those teams “you don’t want to play” come March. If the upper classmen (Johnson, Newkirk, etc) don’t adapt they will end up coming off the bench and we won’t make postseason. A trying year for us as fans, but I’m still super excited for the future! If you are “sick of expecting more of him”, that is on you.. He is known as a hard worker and a high character guy, so he deserves no condemnation. But on the court, he is what he is. I have argued this point at some length, but will say it again: the surprise would be if, as a senior, he was someone he had not been for his first three years. So far there is no indication a surprise his coming, and that says nothing negative about him. To be disappointed in that is to say that the standard of our judgment is who we think he “should” be, not who he actually is. Excellent post. I have argued much the same thing. I won’t argue with Archie; if he says they are soft, they are soft, But the hesitation and uncertainty that come from a new system make it pretty hard to dig deep when things are falling apart. Of course. No one would argue that. Always have liked Rob and have probably expected too much of him. To be very clear….. none of this is on these kids as players. Rob is a good kid. Maybe Darius & Romeo will jump at the chance to rehab our program with Archie. These are similar conditions that brought Cody & Yogi in to build with CTC. I understand that a pullback from prominence hurts in some regards, but not necessarily recruiting superstars. It almost goes without saying that there will be growing pains and this season is naturally a transition year. But I guess the reminder is pretty apt after last night’s embarrassments. I think you really captured the problem in action with the screen examples there. Would be a great one for the film sessions here. Did anyone see any salt between Juwan and Devonte? I thought I might have caught a snub that was pretty stupid on Juwan’s part, but am not sure. Hope there isn’t something there. I’m expecting a pretty mixed bag this season, but still…I expected a decent showing last night at the very least. I’d be surprised if they don’t get it figured out by mid-season and it ends on a general upswing. So many variables and what-ifs going on right now. I just hope the upperclassmen pull through. Good points. It’s a transition year and nothing is ever going to change that. But still, if they slowly get it together (and hit some freekin’ shots! ), they’ll be winning some games over the course of the season. It’s the long-run goals that really matter this year, but I still think they can have a respectable season despite the difficulties of learning a new system. The best part of the game was the press conference afterwards. Probably the first and only time I’ll ever say that. Watching the replay, not much to be optimistic about. My hope is that they just aren’t confident in what they are doing and there’s just some overthinking going on. I agree that we NOW know exactly where we stand as a team and this season should prove to be the perfect “proving ground” for Archie’s coaching methods. But I’m retaining my optimism to see the man hone this team into the NCAA’s. In this picture of the bench…Hartman appeared to be holding his n ose. Appropriate if accidental editorial comment on the Hoosiers performance last night. As far as the, replace him with who part goes, and FWIW I’m not suggesting he be replaced at this point, there comes a time, and circumstances dictate, that when a certain point in the season is reached that it becomes necessary to steer the ship in another direction, so to speak. Almost all coaches, whether they publicly admit it or not, have the mindset that if all things are equal between two players you go with the younger player, especially if one is a senior. What is this love fest with Hartman? He’s been in the program now 5 year’s, has been hurt at some point every year and yet commentator keep thinking has the key to it all. The guy has averaged no more than 6 points in any given year. His defense is not that great, at all, so I for one don’t get it. This may come off as a shot at him but I see it as fact. You were accurate on the predicted outcome with last night’s game. Actually you were extremely accurate! I just didn’t think IU would be that bad. Cudos to you. Sam, the guy is a winner. When he’s on the floor he has that intangible that makes the other players around him and the team better. His D is “right place right time”. He’s one of the most basketball IQ players IU has ever had. What he does for a team doesn’t show up in his personal stats. He’s the glue, the man, the leader. And he needs to be on the floor. It’s hard to believe I waited 6-7 months for that. Was hoping for more out of Newkirk and Johnson…. I thought Morgan and Davis played alright considering there was no outside shooting to open things up for them. That was hard to watch. I”m starting to feel like a Cleveland Brown’s fan. Oh well, I’ll try to brush this one off and chalk it up to in state competition. I agree, there is more nuance to human nature and psychology than the short things I have posted. People grow and change over time, but that change is evolutionary, not revolutionary. Between genetics and a childhood’s worth of experiences, a 22 year old is near full developmental maturity. The broad pieces of our personality — our baseline self-esteem, our introversion/extroversion, our temperament, etc. — begin to set early in childhood. Indeed, educators can predict with great accuracy which students are most likely to drop out of high school by the time they are in the third grade. Different dynamics there than we are talking about regarding Rob, but the point is substantially the same. I’d bet $1000 if we could go back in time and see Rob in little league sports at age 9, we’d see pretty much what we see today: a hard working and talented athlete, but not a dominant or aggressive personality. And barring a traumatic event of some sort, I’ll bet he will be largely the same 20 years from now. Wiser, more experienced, and with new wrinkles to his personality, but unassuming and not one for the spotlight. But it’s not just me you’re disagreeing with, but guys like Alex and other really intelligent basketball writers who see the same things I see.